At the invitation of State Councilor and Foreign Minister Wang Yi, Australian Minister for Foreign Affairs Marise Payne will pay a visit to China from November 7 to 9. Q: On November 5, the United States restored its unilateral sanctions that cover Iran's energy and financial sectors. They are the second batch of sanctions the US has re-imposed since it withdrew from the Joint Comprehensive Plan of Action (JCPOA). Do you have any comment? A: The Chinese side regrets the US decision and we also noted the widespread opposition to the unilateral sanctions and long-arm jurisdiction among the international community. The Joint Comprehensive Plan of Action (JCPOA) is a multilateral agreement ratified by the UN Security Council and should be implemented in a comprehensive and effective way. This is conducive to upholding the international nuclear non-proliferation regime as well as peace and stability in the Middle East and serves the common interests of the international community. Despite the great changes that have taken place in the situation over the past half year, the existing participants of the JCPOA have remained committed to implementing the deal and maintaining normal economic cooperation and trade with Iran in a responsible manner, which is widely supported by the international community. We noted that the Iranian side by far has been strictly fulfilling its nuclear-related obligations under the JCPOA, and the International Atomic Energy Agency (IAEA) has confirmed that for 12 times in a row. The Chinese side commends the endeavors made by the Iranian side. Under the current circumstances, we hope that relevant parties will bear in mind the larger and long-term interests, fulfill due responsibilities and obligations and stand on the right side of history. 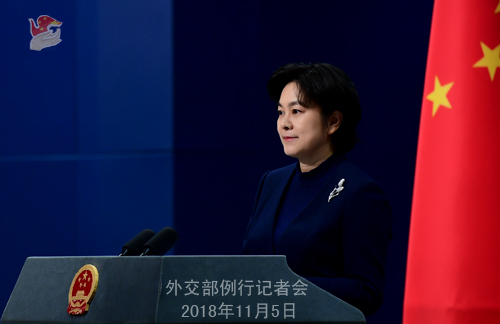 With a fair, objective and responsible attitude, the Chinese side will continue to make unremitting efforts to uphold the JCPOA and firmly safeguard its own legal and legitimate rights and interests. Q: Has the US government granted China an exemption from sanctions on the oil import from Iran? A: We have stated China's position on many occasions. China is always opposed to unilateral sanctions and long-arm jurisdiction. The normal cooperation between China and Iran within the framework of international law is legal and legitimate, which should be respected and safeguarded. Q: According to reports, given that the US recently announced it would unilaterally pull out of the Intermediate-Range Nuclear Forces Treaty (INF Treaty), some believe the INF Treaty should be changed into a multilateral deal which includes China and NATO members. What's your reaction to that? 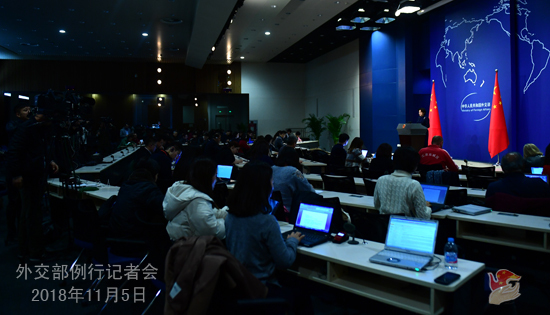 A: The Chinese side already stated its position on this issue for many times. The Intermediate-Range Nuclear Forces Treaty (INF Treaty) is a bilateral agreement signed by the United States and the former Soviet Union. It has played an important role in easing the international relations, moving forward the nuclear disarmament process and safeguarding global strategic balance and stability. It is still highly relevant today. Unilaterally withdrawing from the treaty will have negative effects on many aspects. The Chinese side opposes the unilateral withdrawal of the US side as well as the multilateralization of the INF Treaty. China follows a defense policy that is defensive in nature. We have been highly restrained in building up our military and have no intention to and will never pose threats to any other country. Q: The Iranian President highlighted in an article published in Financial Times that it is essential that the European parties as well as China and Russia present and implement the final package of measures to compensate and mitigate the effects of America's latest sanctions on Iran. Has China submitted its package to the Iranian side yet? What are the basic elements of it? A: As I stressed just now, despite great changes that have taken place in the situation over the past six months, the existing JCPOA participants have remained committed to implementing the deal and maintaining normal economic cooperation and trade with Iran in a responsible manner. The two foreign ministers' meetings held by the participants and the joint statements adopted have made clear this point. Under the current circumstances, we hope that relevant parties will bear in mind the larger and long-term interests, fulfill due responsibilities and obligations and stand on the right side of history. With a fair, objective and responsible attitude, the Chinese side will continue to make unremitting efforts to uphold the JCPOA. Q: Does the upcoming visit by the Australian Foreign Minister mean that the "freezing" of relations that has happened over the past year or two has come to an end? A: We have made clear China's principled position on developing China-Australia ties on many occasions. In September this year, State Councilor and Foreign Minister Wang Yi met with Foreign Minister Marise Payne at the latter's request on the sidelines of the UN General Assembly, during which the two sides had an in-depth exchange of views on China-Australia relations and issues of mutual interest and reached important consensus. We stand ready to work with the Australian side to expand exchanges and cooperation across the board and move forward bilateral ties on the basis of mutual respect, equality and mutual benefit. Q: Has China reduced oil imports from Iran? A: I just made it very clear. China is always opposed to unilateral sanctions and long-arm jurisdiction. 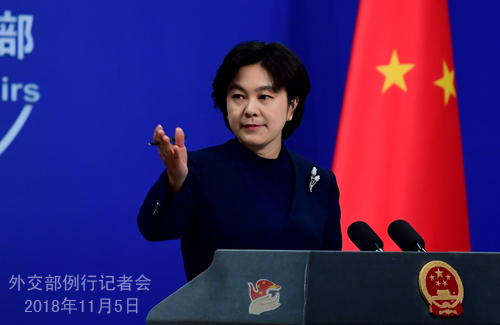 The normal cooperation between China and Iran within the framework of international law is legal and legitimate, and such rights should be respected and safeguarded. We will continue to maintain and implement the JCPOA and firmly safeguard our own legal and legitimate rights and interests. Q: There was a terrorist attack in Egypt against civilians on Friday, killing seven people and injuring over ten others. What is your comment? A: I am not quite clear about this specific terrorist attack you mentioned. Our principled position is that China condemns all forms of terrorist attacks no matter for what reasons they are waged. Q: Reports say that last week the newly elected Brazilian President said that he intended to move the Brazilian Embassy in Israel from Tel Aviv to Jerusalem. Do you have any comment? A: Our position on the issue of the status of Jerusalem is consistent. Under the current circumstances, we hope that all relevant parties will continue to make more constructive efforts to seek a fair, reasonable and proper solution to the issue of Palestine at an early date and uphold peace and stability in the Middle East.